Is there a particular method that has been more effective in the past in similar circumstances? Is there guidance that is more accurate? Are there persistent biases in our forecasts? Do our forecasts perform better in certain regimes than others? 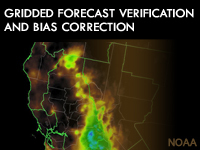 In the era of gridded forecasts, grid-based verification provides more information about the spatial distribution of mismatches between forecasts and analyses. In this module, you will be given an example forecast and verifying analysis. Then you will assess what corrective actions are needed based on the mismatches that occurred.